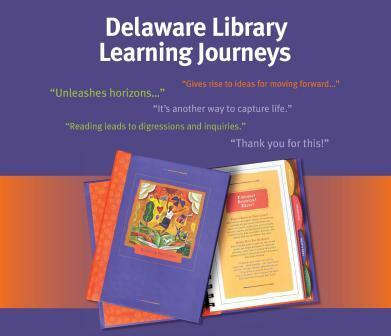 Launched at the 2007 Delaware Book Festival, the path for the Delaware Library Learning Journeys (Learning Journeys) program has always been forward but rarely in a straight line. Informal learning is like that. The beauty of our offering is the shared experience between participants and presenters. As you/they spoke, the well of stories, tools and techniques became deeper and wider; informal learning is like that too. So as it should, the program evolved. As we continue to move forward, a survey invitation may have come to your Inbox earlier this week. Tell us about your own learning journey since attending the program. What tools do you use to track your reading/learning? 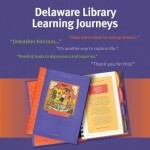 Do you find what you need to “unleash your inner genius” at your library? The survey is available here also. We welcome your feedback. Remember that I use Goodreads to track my learning. Well, guess what I found after digging into the titles there. Here goes: *non-fiction stands at 51% of my reading, fiction at 49% *spirituality was the big winner at 17% of titles *ornamental grass/meadow gardening is at 8% * books that make me laugh – 9%. My Aha Moments? First, “required” reading can be good. Some of my favorite reads were from our Book Festival authors…I may not have read them otherwise. Maybe I need to consider a book club. Second, I need to better track my picture book reading. I’m a picture book addict. But, they only register 2% of my total. Last, I need to buy Kiki Strike:Inside the Shadow City and Caramelo:or Puro Cuento I have reread both of these books…they speak to me…I must own them. How about a few of your insights?